Are your trucks and trailers up to date on their annual inspections? With the new CSA scoring system implanted last year it is important that your fleet is kept up to date and compliant with federal and state regulations. Violations can be costly, both financially and by increasing your CSA score. 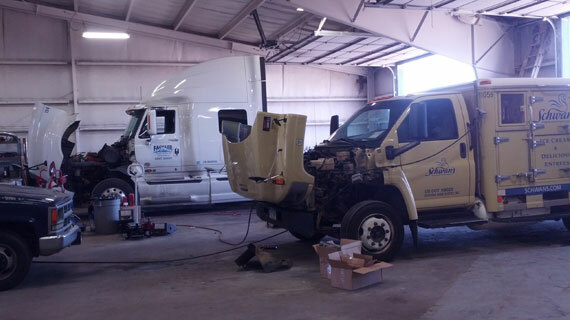 Mobile Transport Repair can help by providing periodical and annual inspections of your fleet. Our certified technicians will perform annual inspections that ensure your trucks and trailers are safe, compliant, and up to date. Some of the most common and costly violations can be found and repaired during an inspection. Minor repairs found can be done on the spot. So call Mobile Transport Repair now to schedule any inspections you may need. Stay safe, stay compliant. Call Mobile Transport Repair today! Mobile Transport Repair has always had a long standing commitment to safety. In keeping in line with that commitment we now install and sell Brake Safe visual brake stroke indicator and Zafety Lug Lock. These products not only improve the safety of your fleet, but save time and money and can improve your CSA score. In the last year since we have implemented these products, we have equipped our largest fleet customer and there have been no brake violations or loose lugs since. Please contact us for pricing and more information.